UV coating is a special liquid that bonds to your game pieces via UV light. It protects your game from dirt, scratches, and moisture. It also makes your game pieces dry erase. **Please be aware that UV coating will not be as visible or uniform on products that have a lot of unprinted area (such as white cards). Coatings do not apply as well to components without much printing. **Please note that any blank stock items that you add to the "Unprinted Parts" section of your game will not be UV coated. You can add UV coating to your game for $.10 per component sheet. 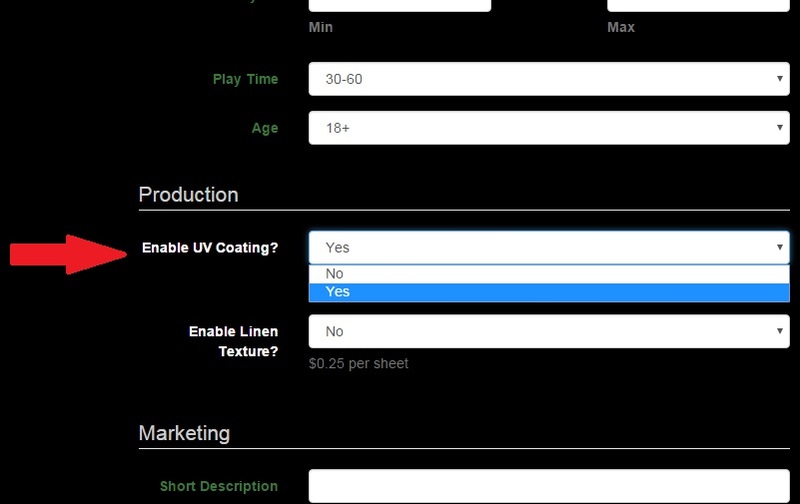 To do so, visit the Edit Details screen in your game and enable UV coating under the Production section.